Milady’s Instructor Training programs are designed to help educators raise the bar of education and training and enhance the image of the beauty and wellness industry. Whether you need Instructor Continuing Education to meet state and/or accreditation requirements*, are working toward your Milady Master Educator Certification or simply want to enhance your educator skillset, these programs (available online or in-person) provide quality continuing education that enriches the personal and professional knowledge of educators, directors, school owners and managers. With tutorial videos, interactive activities and knowledge assessment, you can learn new skills quickly and affordably. School owners, administrators and organizers of state and national associations can host their own on-site trainings. Milady will fly an experienced educator to the event location to teach a one or two-day Milady Master Educator Class. In-person classes are taught by experienced educators and academic trainers by means of colorful and dynamic presentations. Classes are highly interactive, participant-centered and offered in a variety of settings throughout the year. Below are the 15 teaching methodology in-person classes available to choose from. Click on each course for a full class description. Sometimes classrooms can become quite boring! We’ve all seen students looking uninterested, with their eyes glazed over and heads propped up with their hands. When students are not involved or are unable to move around during class and engage in the learning process, they become bored. During this session you will discover techniques to keep your classrooms action packed. You will learn how to kick start your class in the morning, incorporate powerful engagers throughout the day and end your day with action packed closing activities, all of which will help keep your students engaged and involved in the learning process! This program will help participants become great communicators… the kind that gain people's attention, hold their interest, and move them into action. Participants will examine the communication process, identify barriers to communication, learn to listen more effectively, identify their own communication style and key tips for communicating more confidently. This program will arm educators with the tools needed to engage in sound relationships with learners, colleagues, and the community. Participants will learn to practice effective listening skills and other steps necessary for building effective relationships and managing conflict as well as well as identify the six basic needs common to learners of today. Human relations and communication basics will be discussed. This program focuses on the importance of evaluating the team environment and provides specific strategies for building a cohesive and productive team. Participants will define teams and teamwork, identify the benefits of teamwork, the ingredients for team motivation, and work through six practical steps in team building. This program covers step-by-step activities that take participants through every step of developing and delivering a powerful classroom presentation. Participants will understand steps for increasing personal awareness, how to use the C – R – E – A – T – E model with nine essential elements for delivering a powerful presentation. In addition, the ten basic needs of adult learners will be thoroughly discussed. This program will show participants how to identify and develop the leadership skills that are required of a Master Educator. Participants will understand how to build accountability in their students and will be given the tools to create trust and set clear expectations in order to ignite exceptional performance in both themselves and their students. Participants of this fun and informative program will learn to embrace change, rather than resist it. They will recognize that change touches our lives daily and that change is what gives us the opportunity to be ourselves and make our lives everything we want them to be. The class will cover ten key facts or strategies for adapting to change as well as four rules for rituals in education. They will also learn through hands-on activities the formula for activating learning for every student. This program will leave participants with substantive information and strategies to make their classrooms a lot more fun which enhances learner retention. Participants will define laughter and identify its purpose in learning and the effects of laughter on the brain. They will recognize the benefits of laughter and its effects on stress as well as solidify how laughter enhances creativity. Strategies for integrating laughter into the learning process will be reviewed. This program will prepare educators to meet the needs of the industry through the success of their graduates. Participants will learn to assist students in developing a solid client base using referrals, rebooking, ticket upgrading and so much more. The importance of teaching learners how to develop success habits while in school will be reviewed in detail. In this information-packed seminar, participants will learn the essential ingredients behind the most common success story in education. Based on the theory developed by Howard Gardner, attendees will understand that each student in their classrooms learns through various multiple intelligences and learns through some intelligences more readily than others. Seminar attendees will review detailed characteristics of each learning style as well as student and teaching tips effective for each style. This program gives educators the tools to develop their own creativity and bring more variety, enthusiasm, and energy to the classroom. Participants will learn effective and critical techniques in both teaching and learning methods including interactive lecturing, demonstrations, discussion, role playing, window paning, mind mapping, case studies, concept connectors, mnemonics, energizers and so much more. This program covers the various principles of managing learner behavior and chronic misconduct. 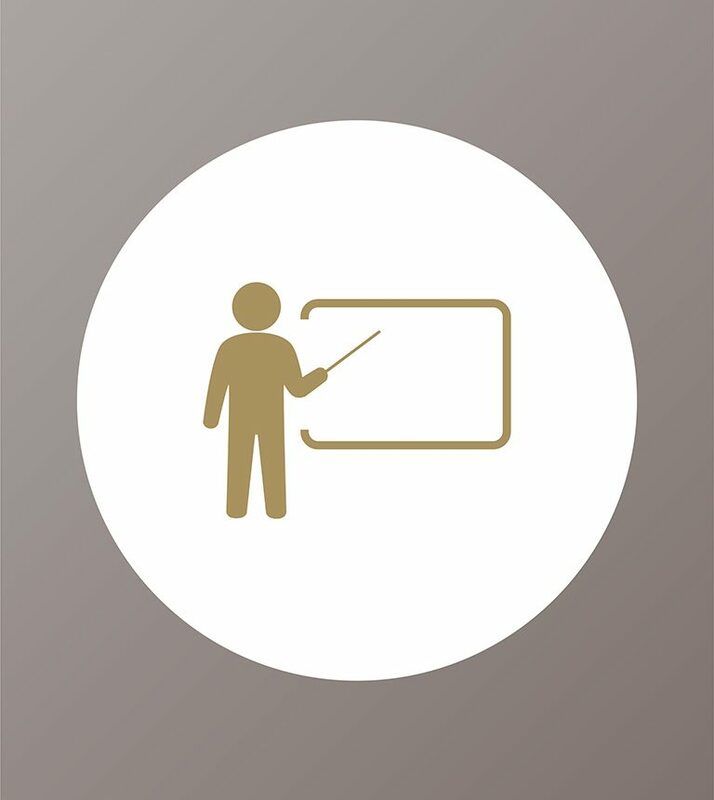 Participants will learn low to high profile control techniques, identify chronic and situational barriers to learning, understand principles of academic advisement and review the four enemies of conflict management in relationship building. Seven chronic learner behaviors will be dealt with in detail. This program helps schools and teachers apply effective school management principles to increase student retention and improve student success. Participants will understand strategies for establishing a vision and plan, having sound administrative and ethical practices and defining the school's culture. They learn the importance of instilling student ownership, having energized educators, and developing a P – R – A – I – S – E policy. In this program, we offer ideas and solutions for teaching your students how to communicate with their customers. You'll be able to guide them to effectively recommend services and retail products. We'll focus on building clinic floor traffic, increasing retail sales, doubling chemical sales, finding and filling clients' needs, and much more! You will discover how to work smarter, not harder. Motivation is defined as the reason one has for acting or behaving in a certain way. It is an internal choice that a person must make. As an educator, is there anything you can do to motivate your students? YOU BETTER BELIEVE IT! You see, students are a lot like fireworks; their power is all on the inside. Nothing happens until you light the fuse. Your mission is to light that fuse! Are you ready to accept the mission of motivation and light the fuse? Milady's Master Educator Program provides participants with the ability to achieve Master Educator Certification status, which signifies a commitment to growth, professionalism and success as an educator in the beauty and wellness industry. This program consists of two different levels of certification for educators across the country. Complete on your own time. Receive a Master Educator Certificate of Completion to display in your school. Both in-person and online instructor training classes can count towards your Master Educator Certification. One 3-Hour Online Class = 1 Master Educator credit. *Previous online Faculty Development classes completed will still count towards your Master Educator Certification. To receive your Level 1 Master Educator Certification you must complete a total of 12 classes. To receive your Level 2 Advanced Master Educator Certification you must complete a total of 18 classes.